ORB Sleep Complex Review - Do the Side Effects Affect You? A good formulation supported by innovative time-release technology makes this sleep aid a Must Try! ORB's sleek look and 30-day return policy also get brownie points from us. What’s in ORB Sleep Complex? What’s the Suggested Dosage of ORB Sleep Complex? What Are the Side Effects of ORB Sleep Complex? Does Orb Sleep Complex Come with a Return Policy or Guarantee? How Much Does ORB Sleep Complex Cost? Corr-Jensen Inc. is no stranger to the dietary supplement industry. In fact, they’ve been manufacturing and marketing health and wellness products since 2008. The company isn’t a household name—like Kirkland or Natrol, for example—but their product lines may be more familiar than you think. Newest in Corr-Jensen’s house of brands is ORB: a game-changing line of vitamins and supplements for the forward thinking. ORB features a unique delivery system supported by a patented dosing technology. The bottles are sleek and portable, the pills aren’t very large, and the formulations promise a more refined approach. The key ingredients of ORB Sleep Complex are Melatonin, Valerian Root, and Methylcobalamin (also known as Vitamin B12). Amino acids GABA, L-Theanine, and 5-HTP are present, too. Also included are extracts of Chamomile, Lavender, Lemon Balm, and Ylang Ylang. ORB Sleep Complex is a melatonin-based sleep aid blend. The formulation focuses on more rapid sleep onset, a lengthier and more restful sleep duration, and less lethargy upon waking up. In other words, ORB Sleep Complex asserts that it can not only help you sleep faster, but longer, as well. Many sleep aids and sleeping pills can leave you with a “hangover” or a grogginess that’s hard to shake off. 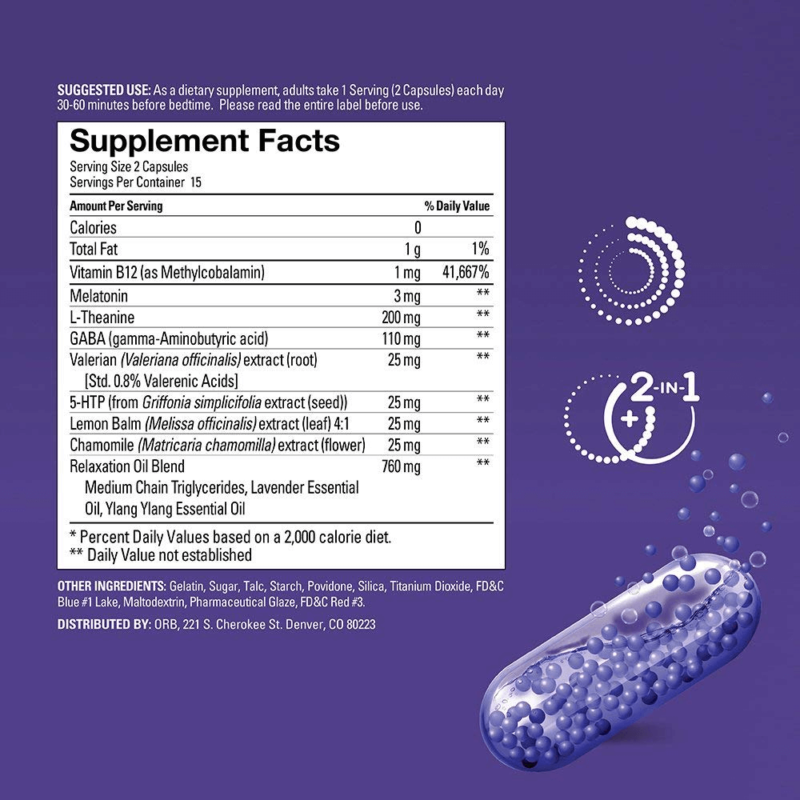 The composition of this supplement works to avoid that feeling, and also aids in relaxation and stress relief. ORB Sleep Complex values sleep health, but not at the expense of the quality of your waking life. As with every dietary supplement, it is important to remember that ORB Sleep Complex is not actual medication. Please consult a healthcare professional before you add any dietary supplement or vitamin to your daily habits. ORB Sleep Complex is not meant to be a medicine replacement or a 100% effective cure or treatment for any disease or disorder. However, it may be a beneficial addition to your existing routine and diet. 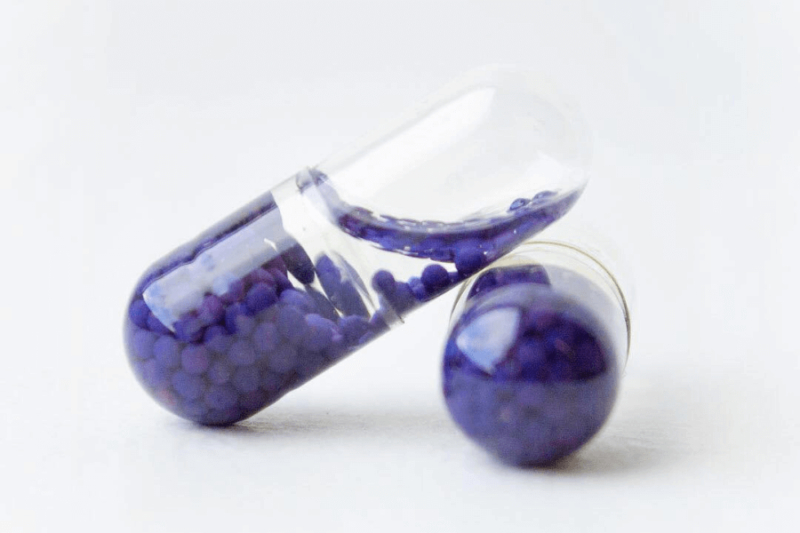 The transparent ORB Sleep Complex capsules show off the binary delivery system that uses both oil and tiny beads. The oil is a nutrient-rich blend, but what’s the most impressive here is the addition of the beads. The latter benefits from Corr-Jensen’s patented Terra Intelligent Dosing Technology. The innovation, pioneered in Corr-Jensen’s PERFORMIX products, allows for a cascading release schedule of many ingredients. The time-release profile of each formulation optimizes its effectiveness. This is the real difference between ORB Sleep Complex and other similar sleep aids. Want to find out more about what’s inside this supplement? Let’s take a closer look at the individual ingredients and their respective roles in the formulation of ORB Sleep Complex. Melatonin needs no introduction, but we’ll refresh your memory anyway. It is the natural hormone that regulates the body’s sleep-wake cycle. Melatonin has become so popular these days that it’s even marketed and sold as a single-ingredient sleep aid by some companies. Studies suggest that GABA and 5-HTP are complementary amino acids that promote sleep health. GABA reduces the activity of certain brain cells, resulting in a sedative effect. 5-HTP increases the production of serotonin; which can affect sleep, appetite, mood and behavior. Both GABA and 5-HTP are naturally occurring amino acids in the body, but you can find them elsewhere, too. There is GABA in some fermented food. Commercially available 5-HTP comes from an African plant called Griffonia simplicifolia. We’ll delve into the plant extracts shortly, but it’s worth noting that the inclusion of L-Theanine comes from herbal tradition, too. It’s present in green tea and is often present in anti-anxiety and heart health supplements. Some vitamins are important for sleep health, and Vitamin B12 is one of them. Vitamin B12 has several forms, and Methylcobalamin is often touted as superior compared to others. Some studies have shown that a deficiency of Vitamin B12 can cause insomnia and other sleep disorders. There is evidence that Vitamin B12 can help keep body’s circadian rhythm steady. ORB also states that the timed release of this ingredient in their sleep aid is what provides energy and alertness upon waking up. These plant-derived ingredients all have centuries-long histories of medicinal use. This subsection of ORB Sleep Complex’s formulation is the most predictable, with the possible exception of Ylang Ylang. Chamomile, Lavender, Lemon Balm, and Valerian root are present in ingested folk remedies. They’re also popular additions to sleep-inducing tea blends, essential oils, and sleep mists. Ylang Ylang is popular in variations of the latter two, as well; as it’s typically not ingested but used as an aromatic or topical treatment. Although many of the ingredients fit the bill, ORB Sleep Complex is not touted as vegan supplement. ORB does not seem to target all-natural health buffs; instead, the feel is scientific and vaguely futuristic. Should you be looking for a vegan alternative, you can check out Nested Naturals LUNA. The unique delivery system and complementary time-release schedule are very interesting. In our opinion, the technology almost eclipses the actual formulation of ORB Sleep Complex! It really presents itself as a a possible game changer in the industry. Corr-Jensen brand PERFORMIX uses the same patented technology. Their products have been noted as a cut above similar counterparts. However, the newness of the ORB product line makes it difficult go on anything else other than that. ORB suggests a dosage of two capsules daily. Because it is a sleep aid, ingestion should be near the time you want to turn in for the night. About 30 minutes to an hour before bedtime is ideal. The typical warnings apply: Don’t operate machinery or drive any vehicle after dosing. Don’t exceed the recommended dose; and don’t take ORB Sleep Complex if pregnant, nursing or planning to conceive. ORB also recommends discontinuing use two weeks before any kind of surgery. Some ingredients are sedative, and drug interactions with these may complicate medical procedures. A reoccurring complaint we’ve seen in negative feedback is an increase in daytime drowsiness and grogginess. However, ORB does not discuss possible side effects on their official website. In our opinion, the product is too new to glean this information from a sizable enough number of verified customer reviews. The most prudent thing to do is to go over the individual ingredients one by one with your doctor. Should you decide to take ORB Sleep Complex after this exercise, you will at least be armed with enough information about possible issues. For example: A key ingredient is Valerian root, which can lead to uncomfortable grogginess and vivid dreams. L-Theanine can lower blood pressure and cause dizziness. Even the mildest herbs—Chamomile and Lemon Balm—can trigger allergic reactions. How Effective Is ORB Sleep Complex? Like most dietary supplements, 100% effectiveness is not something to expect. Experience will always be different from person to person. Because ORB Sleep Complex is so new, there is not enough information to discern the real pros and cons of this product in an objective manner. That said, most of the customer feedback we’ve come across has been positive. Of course good reviews will always be front and center on a brand’s official website; so on top of looking at those, we checked comments on Amazon and other online retailers, too. Of the more than 50 reviews of ORB Sleep Complex on Amazon, almost 70% rated it four or five stars out of five. The remaining percentage consists of lackluster or negative feedback. As we mentioned above, this chunk of assessments includes a few complaints about excessive grogginess. Much more common, though, were comments that simply said ORB Sleep Complex didn’t work for them. Where Can You Find ORB Sleep Complex? ORB has its own online store, and ORB products are available on other online retailers, too. Sites like Amazon and H-E-B carry ORB and other Corr-Jensen brands. If you can, we suggest you purchase from ORB directly—and we’ll explain why later on. If you would like to actually go out and buy a bottle, ORB Sleep Complex is also stocked in Meijer and Walgreens stores across the US. GNC, The Vitamin Shoppe and Vitamin World carry ORB products both online and on physical store shelves. Corr-Jensen has a great track record. They have spent a decade developing and marketing brands that sell supplements, vitamins and other products. They’ve tackled weight loss and athletic performance. ORB is an understandable way of branching out: A brand new venture into the industry of health and wellness. As a parent company Corr-Jensen is low key, with only a sparse official website to talk about their product lines. Instead, each brand has its own website and social media accounts. The ORB official website used to be little more than a press release went it first went live! It was one of the red flags that made us very caution about recommending ORB Sleep Complex. We’re happy to report that as of this review update, we’re seeing much needed additions and changes—which we’ll discuss below. What Quality Assurance Does ORB Sleep Complex Go Through? There are no displayed accreditations or certifications on ORB’s official website. They don’t even talk about this in press releases! The bulk of the attention is on the technological aspect of the formulations and delivery system. The attractive and eye-catching packaging and design is also often mentioned. We did find confirmation that ORB products are made in the U.S. with cGMP compliant ingredients at a facility that’s FDA-registered. What’s odd is that we found this on ORB Sleep Complex’s Amazon product page, and nowhere in the official ORB website. Most companies go to great lengths to specify and itemize their quality assurance practices—not ORB. How Is ORB’s Customer Support? 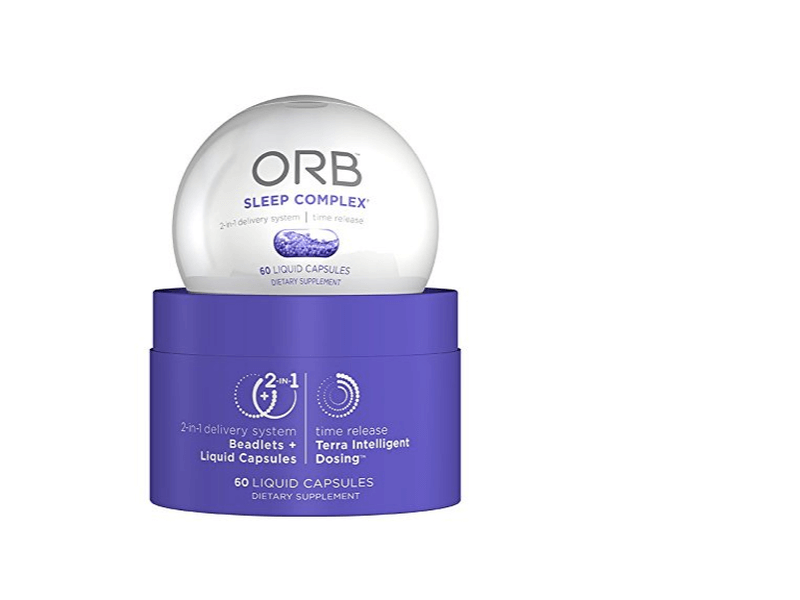 When we first reviewed ORB Sleep Complex, there was not much to go on. We assumed then that there was no guarantee or return policy, or even customer support. Thankfully, things have changed! Not only is ORB’s official website up and running with an online store, but there’s a working FAQ section, too. Customer support is available through a contact form, although ORB encourages you to reach out to them through their social media. You can find them on Instagram, Facebook and Twitter as @ORBWellness. We also love that ORB’s support team is hands-on even when it comes to answering customer queries posted in retailer sites like Amazon. It’s not explicitly stated as a guarantee, but there is one. ORB says that if you are not 100% satisfied with any of their products, you can return it within a 30-day window. You can receive a refund or opt for an exchange. Note that there are other caveats to the return policy apart from the time window: Returns must include all original packaging. A brief reason for the return must be provided. The refund does not cover shipping and handling. Also, the customer is responsible for charges incurred during return shipping. Here’s the most important part: The return policy does not apply if you buy ORB Sleep Complex from another online retailer. It only works if you buy from ORB’s online store directly. If this happens to you, it helps to check if the online retailer has its own return policy that you can avail of instead. Both ORB’s official online store and Amazon price an ORB Sleep Complex bottle of 30 capsules—enough for two weeks of daily use—at $19.99. ORB also offers free shipping for purchases made within the United States. 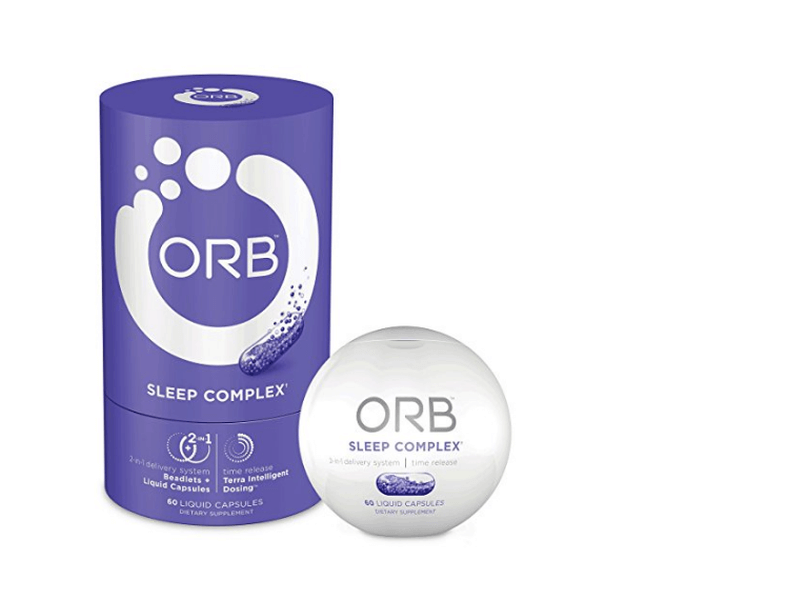 Visit Amazon & Find ORB Sleep Complex Deals Now! We repeat this over and over in every review, but it’s always important: Please talk to your doctor about this product before taking it. Self-medicating can be dangerous and can mess with existing maintenance medications and diets. Now, on to the real conclusion: We were originally unimpressed when we reviewed ORB Sleep Complex a year ago (August 2017). We’re happy to report that all the red flags we pointed out then are now fully addressed! There is customer support and a return policy, and the product has now been in the market long enough for us to see patterns in customer feedback. Even the current price point is a lot more affordable. The only thing that’s still lacking is detailed information on quality assurance and ingredient sourcing practices. We’re huge fans of innovation, so the binary delivery system paired with the time-release technology really has us hooked. Now that this is supported by a guarantee and a responsive support team, we find no reason not to recommend it! Just make sure that there is a way for you to return the product, should it not work for you.